We advise against all but essential travel to the interior of Cabinda Province. There have been kidnappings and other attacks on foreigners in the province, where there is a separatist movement and a large military presence. Travel outside Luanda can be difficult and dangerous. 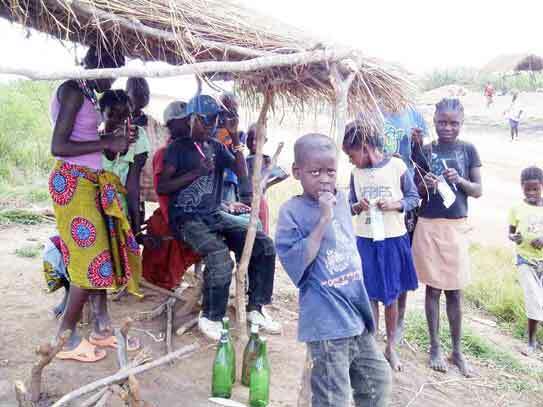 There is widespread poverty, social exclusion and disease; a shattered infrastructure and millions of mines and items of unexploded ordnance throughout most of the country. - Current British Foreign Office information. The chief, a huge man in his mid forties with dark glasses, seemed very obliging, and told me to get out to the airport immediately, that he would look after me out there. We had a language barrier, he having no English, me no Portuguese - so that's what I understood he meant! I didn't have much time to consider this option fully, but shot back to the mission, packed my bike and headed for the airport. Sadly, my new friend wasn't really much help, though mentioning his name did assist in my attempts at getting information. 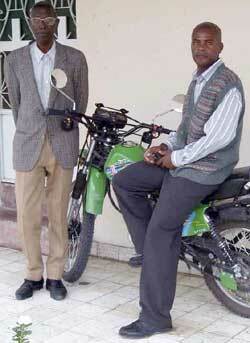 In the end I was quoted US $350 “as a favour” to fly me and the bike to Luanda. I wasn't interested. Preparing to leave thinking that was a waste of time, one of the friendly customs officials suggested I enquire at the military airport a hundred yards further down the road. The guard at the gate listened to my query with interest before fetching the officer on duty. “Yes, there is a plane this afternoon”, the officer smiled obligingly. So it wasn't ruled out yet. “How much can you pay?” This exchange, in the shade of a tree in the afternoon heat, was conducted in a relaxed, slightly guarded and nearly teasing manner. I wasn't altogether confident I was speaking to the right people but at least the possibility was still open. “A hundred and fifty dollars”, I answered, picking the figure out of the air, roughly using the commercial boat and plane fare as a reference. He mused on that one, not objecting to it. Then in what I took to be an agreement, he said the plane would be here in the next few hours and it would be better to wait inside the compound, ushering me over to a group of soldiers lounging about under a large mango tree. Had I offered too much? Maybe he would have taken much less - I didn't of course expect to be issued with a ticket, it was cash in hand! My arrival on the bike caused quite a stir of curiosity, but conversation was a little limited because of the language barrier, and after a while the interest in me waned and the soldiers returned to a desultory passing of the afternoon, arguing in sub groups, joking. Three o'clock the departure time came and went. Three hours passed, a good lesson I repeated to myself, in patience. All this time I still wasn't fully confident there was going to be a plane let alone that I'd be allowed onto it! I had handed over the US $150 to the “officer on duty”, trusting my intuition I wasn't getting taken for a ride. And I realised I'd made a decision to fly. The alternative had been to pay US $280 for a three hour boat ride. Dozing in the heat, I was shaken awake at about six, our plane pointed out coming in to land. There was an increase in activity in the barracks, and people appeared from everywhere, military family members getting ready to be transported. From the milling throng, I spotted two officers make their way towards me and anticipated their purpose. Basically there was an attempted shakedown for more money (“$150? Muito poco!”) which I successfully parried until they had to leave. Instructed to stay where I was under the tree, as everyone filed towards the airfield, I obeyed, understanding that a premature arrival at the plane might cause awkward questions. Then, unable to delay any longer, I fired up the bike and rode onto the airfield, ignoring a troop and their officers at attention by the gate, and across the two hundred yards of concrete to the back of the huge military transport plane. Two narrow ramps ascended at a worryingly steep angle into the hold. As I was removing part of my luggage, three Eastern Europeans in uniform approached me and introduced themselves as the Ukrainian crew. Their plane was subcontracted to the Angolan military, and they were intrigued with the sight of my bike, not having transported anything like this before! Very friendly and curious, they seemed impressed by my journey, chatting with me about the different countries, the terrain - and yes, I was discussing my GPS and navigation with the aircrew! I felt slightly more onside and less of a subversive trying to sneak onto the high security military plane. With their permission - a shrug of the shoulders - I prepared to embark. The sooner I was on, the less chance there was of any unwelcome objection. Without thinking too much about it, I lined up the bike, stood on the pegs and rode up. Flashing through my mind was the thought that if I faltered at all, it wouldn't take much to fall off the 45 degree angled, ten inch wide ramp about three metres high! It was with a little thrill I popped up into the hold, startling I'm sure the hundred odd passengers sitting along the sides and floor with the noise of the engine. This was strange after so long on the bike - sitting in the aeroplane hold, the loading completed, everything tied down and the crew retiring into the cockpit. 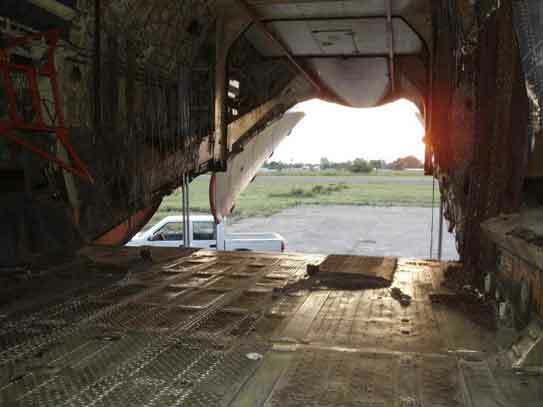 It was a troop carrier and cargo plane - the only concession to human freight a line of seats running partly along the side of the aircraft. Inside was six or seven metres across, and maybe four or five in height. Hydraulic pulleys on rails to assist loading, with cables tidily gathered, spanned the length of the plane. The noise was tremendous as the engines warmed up for about ten minutes, before we took off into the evening. Men, women and children were arranged tightly on the seats along the aircraft body wall, others propped and sprawled across the cargo of timber. The noise level prevented conversation, and with the heat, drove most of the passengers into dozing within a few minutes of getting in the air. Two little girls were slumped against me. With one porthole on each side, craning my neck to peer through the landward one it was just possible to make out the great dark expanse of the Congo river mouth as we flew over. The distance I was covering cut off two hundred and fifty miles of road journey. I didn’t feel I’d compromised my journey. We were in the air about half an hour before landing in the big smoke - Luanda. It was a great feeling cruising across the expanse of the Luanda runway on the bike as I headed for a far exit, passing unchallenged a pair of guards at the gate dealing with a military truck, and onto the streets of Luanda. What to do from here was going to be interesting, in a city reputed to be one of the most dangerous on the continent, particularly after dark! I pulled over recognising a soldier on the street who'd been beside me on the plane, and asked him directions to the nearest 'Missao Catolico'. Hotel prices here were way beyond my budget. With the soldier on the back on the luggage, we negotiated muddy and potholed side streets in the dark before pulling into the sanctuary of a local church. This being a particularly dodgy area, they were not so keen to put me up or allow me pitch my tent in their small grounds. Four of the staff, aspirants, piled into an expensive 4x4 belonging to someone’s father, and we spent the next two hours tracking down other parishes and calling at priests in their homes. Eventually I had the mosquito shell of my tent pitched in a large hall of the Sagrada Familia, extremely grateful to the posse (pictured above) who had gone out of their way so much to find me a refuge. I spent a couple of days in the capital, looking after some bike maintenance matters. Calling into a local garage for a few bits and pieces, I was greeted by the proprietor, Roberto (pictured right), a larger than life character who his group of buddies present seemed to idolise. It happened he was a keen off roader, as the collection of fading motocross photos pinned to the wall attested and when he heard what I was up to he couldn’t do enough in offering help, writing down names of fellow enthusiasts further south on the route. And that was it for me in Luanda. Despite the generosity of the parish, classes started early in my ‘bedroom’ and I had to be out for the day. The restrictions on walking around at night, together with the expense of the place didn’t appeal. Besides indulging myself in European pastries and espressos (at a European price! ), after two days there wasn’t much to hold me and I was keen to move on. 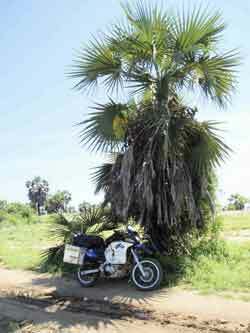 I had decided to take the coast road to Benguela south, and after an hour’s riding I eventually left the outskirts of Luanda behind me. It was early morning and fortunately I was riding against the rush hour flow of hundreds of thousands of Luandans in cars, bicycles but mostly overflowing minivans. Like any large city at that hour, a huge mass movement of workers. 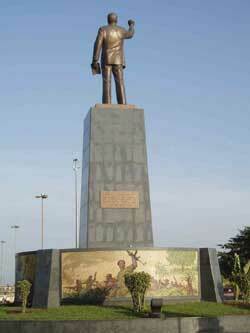 At least it is a sign of economic activity, apparently absent in Luanda for many years. A good road headed south through the sparsely populated Parque Nacional da Quicama. The vegetation was bush and scrub, though green! Tiring after three hours I pulled over at a roadside stall for sustenance. Three women very traditional in appearance were seated on the ground eating a meal with their fingers, and I pointed to their food requesting a half portion! It was, I was told, ‘cabra da mata’ - translated later for me as ‘bush goat’ - and funge, a white corn porridge. She pulled the head of the animal out of a pot to aid me in identification, which didn’t help much. Some form of antelope. The reduced sauce was good and meaty, though the meat a little strong tasting for me. One of the women, in shorts, was seated opposite, her legs spread open in front of her, quite unselfconsciously, and it was I the Westerner who found I needed to consciously avert my eyes. The image remained in my mind for quite a few miles after! The approach to the fishing town of Porto Aimbo is very picturesque, a wide sand fringed bay below the road, the town tucked into a natural harbour at the far end. Getting nearer, it became clear the town was largely composed of circular huts roofed with leaves. On closer inspection no longer did it appear so picturesque - the structures were very basic, the tracks between them badly rutted, with rubbish strewn about - an air of impoverishment about, along with a strong air from the fish factories on the shore! This appeared to be a working town out of work. 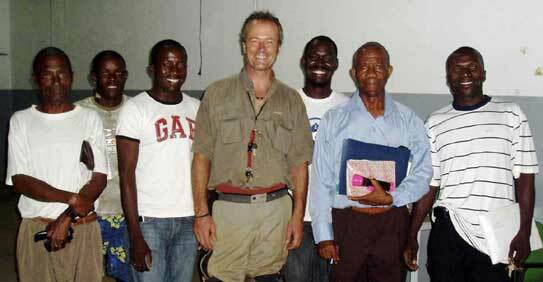 I subsequently read the war years had badly damaged Angola’s rich fishing industry. And it occurred to me thirty years of war will choke any charm from a society. Alioune Blondin Beye, UN representative from Mali. In any discussions with Angolans about the opposing sides in the war, I didn’t come across obvious sympathies for one side or the other. 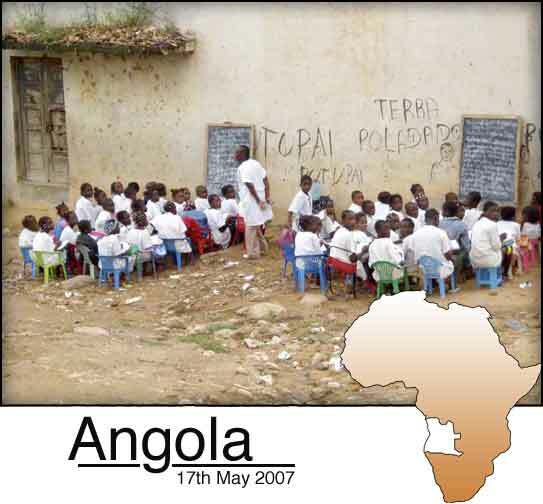 Angola (and Cabinda) was a colony of Portugal and after a 14 year guerrilla war of independence, and the overthrow of Portugal's fascist government by a military coup, Angola's nationalist parties began to negotiate for independence in January 1975. Almost immediately, a civil war broke out between the liberation movements MPLA, UNITA and FNLA. Broadly speaking South African troops struck an alliance of convenience with UNITA and invaded Angola in August 1975 to ensure that there would be no interference (or support for the illegal South West Africa People’s Organisation - SWAPO) in Namibia, which was then under South African control. 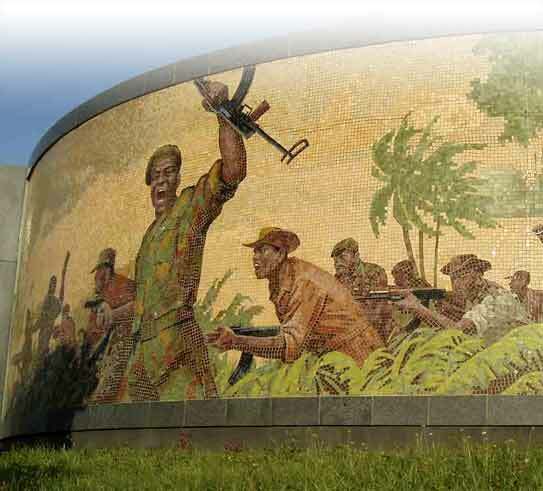 Along with covert military aid from the United States through the CIA, and several Western European countries, UNITA built one of the largest armies in Africa under their charismatic and infamous leader Jonas Savimbi. Cuban troops then came to the support of the MPLA in October 1975, enabling them to control the capital, Luanda, and hold off the South African forces. The MPLA declared itself to be the de facto government of the country when independence was formally declared in November 1975, with physician, poet and philosopher Agostinho Neto the first President. In 1976, the FNLA - founded by refugees in the Congo under Roberto Holden - was defeated by a combination of MPLA and Cuban troops, leaving the Marxist MPLA and UNITA (backed by the United States and South Africa) to fight for power. The conflict raged on, fuelled by the geopolitics of the Cold War - as one priest later told me “international conflicts fought out on our soil” - and by the ability of both parties to access Angola's natural resources. The MPLA drew upon the revenues of off-shore oil resources, while UNITA accessed alluvial diamonds that were easily smuggled through the region's very porous borders. Jonas Savimbi was killed in a shootout with government forces in 2002, after which UNITA gave up their armed resistance and signed a peace agreement. To an observer travelling through the country by bike, it seemed the country is in a poor way after 27 years of civil war. The infrastructure is in tatters, and the economy is seemingly dependent on oil and diamond revenues, with little other local enterprise. Food production is a problem, with agriculture only now getting back on its feet. 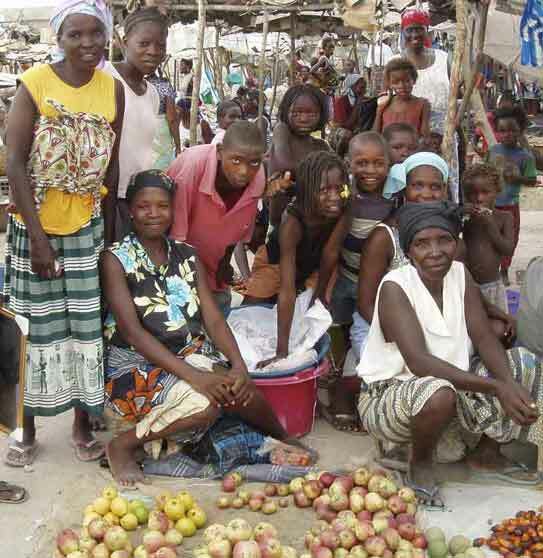 The population in general live in poverty and I came across a widespread frustration with the level of progress achieved under long time President Dos Santos, with little apparent resources going into education, health and roads. As one observer cynically told me - why put money into the roads when the wealthy can afford to fly! 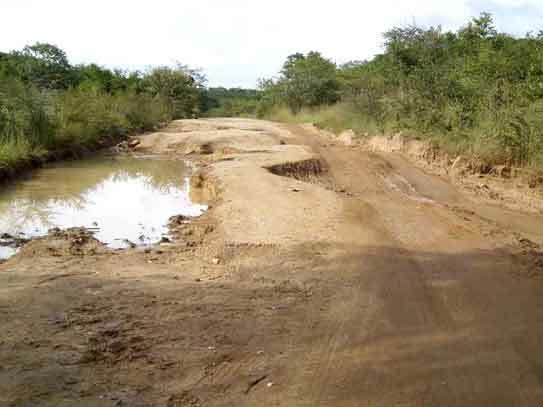 Road conditions deteriorated after Sumbe, halfway to Lobito. Badly potholed - basically meaning low speed to avoid damage to the wheel rims! This was to be the beginning of some seriously bad roads! In the early afternoon I turned down a little sandy track through the thick greenery towards the sound of crashing surf, and parked up in the shade of a palm tree for a bit of a snooze. Possible by turning around with my head on the tank bag and feet over the luggage! But not before traipsing in my boots and gear across a series of dunes to the beach and crashing surf. I was on the shore of a bay, a settlement in the distance. There were no thoughts of getting in as the surf was rough and the irregular waves indicated suspect patterns under the surface. Yet there was a great feeling in the hot sun of... standing on the wild Atlantic shore of Africa. So far this coast was very lightly populated. Later, arriving at a stationary line of traffic, I rode a half kilometre past it to investigate the hold up. It was the Chinese! As I was to encounter a number of occasions in Angola, Chinese contractors with Chinese equipment operators and local labour, were rebuilding some of the main roads. I heard different reactions to this. Some Angolans bemoaned the fact big money was spent on them coming in to rebuild the roads when the Angolans should be doing it. I also heard comments about the quality - potholes were appearing in some already. Others pointed out that there wasn’t enough local engineering expertise, and besides, Chinese companies were the only ones who actually would invest in Angola, clearing unexploded mines from the roadside before going in with their earthmoving equipment. The road was blocked to traffic, but I was waived through by a group of drivers chatting near the front - “sure, a bike will get through”. And indeed I did, along a narrow strip running along the newly laid asphalt, leaving the long queue waiting for I didn’t know how much longer. 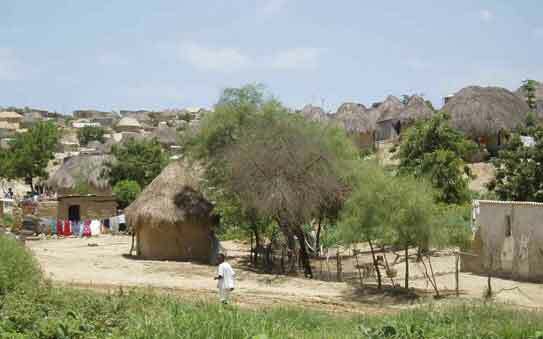 Eventually I descended down past the shanty town and market to the large port of Lobito and found the Missao Catolico. Just after arriving, an hour long downpour flooded the streets, which meant when myself and the deacon “Mr Smith” as he called himself went to find something to eat, we had to wade across the street. I pulled my trousers up from the filthy water avoiding I didn’t know what kind of sewerage might be flushing around. The search for seafood in this port city proved fruitless and after wading to a few restaurants, had to make do with the ubiquitous fried chicken. The following morning the genial Padre Joseph made me feel very welcome. He had spent some time in Drogheda to learn English and spoke very fondly of his time there. When I asked about any internet availability in the city, he insisted I use the computer in his bedroom. I needed to use an internet and he had one. Simple. The bedroom was small and a little dishevelled, papers, folders, clothes on any available surfaces. Without ceremony he ushered me through to the desk and got me online. Maybe the idea of privacy is a Western thing. Leaving Lobito the following morning I passed a number of bikes being washed in the flooded streets. My next stop was a Cistercian monastery not far away in Cavaco outside the nearby city of Benguela. Calling first by mistake into a Dominican convent, I was greeted by the Guestmistress through a tiny four inch square iron window. The mistake was immediately apparent and she put me right with a huge, beautiful smile before closing the little iron shutter. A little further was the Monasterio Trappista. Padre Miguel, Padre Antonio and the postulant Sergio were the only ones there, the rest of the community away at a conference. I spent two days in their company and what a contrast it provided to my regime of constant change, activity and animation. Not only was this a Cistercian, or Trappist, monastery which is quiet with little in the way of distractions at the best of times, but now the community was reduced to three. The monastery is on the grounds of what used to be a farm, the original small though solid farmhouse in the colonial style, used for visitors. The community farmed bananas, harvesting eight tons every three months. Maize also took only ninety days here to mature, half as long as higher up inland. Under the shade of long established mango trees, outbuildings behind were used as kitchen, refectory, and lodging for the few aspirants. The chapel, L shaped cloister and monks quarters were built in the previous ten years. I was given the tour proudly by Padre Miguel who helped found this monastery from the community in the inland city of Huambo. 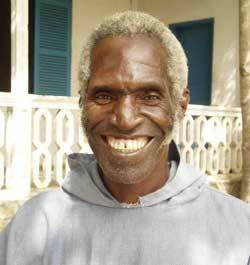 Padre Miguel’s most striking feature, apart from his humility and gentle manner, was his extraordinary smile. It seemed to illuminate anyone in the company. It was impossible not to be affected by his presence. The three of them were intrigued by my journey and with the bike - Padre Miguel had been been a mechanic before joining the order. One evening all of us - the two monks, Sergio and about five teenage aspirants - huddled around my iBook and I gave a slideshow of the journey to date. All the doors and windows were opened to benefit from any puff of air to stir the oppressive humidity. They were all fully engaged in seeing pictures of their continent, fascinated with images of muslim West Africa and the Sahara desert in particular. Pictures of muddy conditions in neighboring Congo - interesting to me - didn’t seem to hold their attention. Indeed why would it - it’s so familiar. The food was a real treat - in fact one meal we had cabbage and potatoes! Nothing too indulgent, but wholesome and well balanced. I made the most of the vegetables, my diet to date not including much green! On the morning of departure, I asked about one of the young aspirants who was recovering from malaria. He was being administered 2 ampules of chloroquine a day for five days. I left with them a packet of Artemesia seeds and explanatory leaflets I’d been given way back in Burkina Faso by a French farmer who was growing and distributing the Chinese herbal anti malarial. It is seen by more medical practioners now as a safe and effective alternative to the pharmaceuticals. The above was written in 1999 by Pedro Rosa Mendes in his impressions from Angola after the war. I had been given assurances it was safe, if unpleasant. ‘The trip is long and painful… The road is awful.’ If the first warning is now redundant, the second observation is still accurate. It took me two days to travel the three hundred and fifty kilometres. 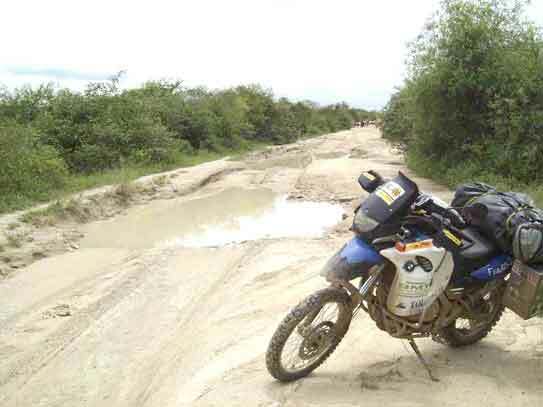 The roads in Angola turned out to be the worst I’d encountered on my journey through Africa. Columns of Russian supplied tanks twenty years previously had scored the surface so badly, the weather and truck traffic did the rest leaving the roads destroyed. 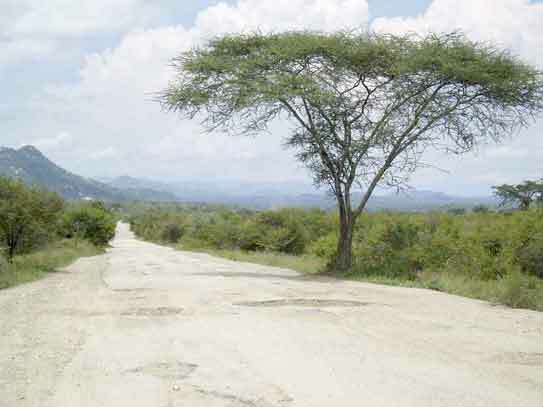 About thirty percent of the tarmac remained, in patches, blots, random strips, the dirt between scoured out into a series of potholes some metres wide and deep. I was in the rainy season. But... with a bike it was easier than four wheels and I could navigate around the holes for a large part. The speed was down to first and second gear for hours on end, body pulled up standing on the pegs. This was work. At one stage the rear wheel skidded from under me while rounding one hole and the bike was on its side, the front wheel over the edge of a slope. This was interesting. If I lifted the bike up it would be pointing down into a gully. A reverse gear would have been handy! It was too heavy to pull around. I smoked a cigarette and waited a while in the hope of hearing someone that might help, but this was a very quiet road with just the odd 4x4 having passed me so far that morning. The circumstances focussed my problem solving capacity. I lifted the bike, and as it dropped, managed to pull the front wheel until after a few repeats I had the bike parallel to the road. Gingerly mounting it careful not to disturb the equilibrium as my foot could only reach the uphill side, I started the bike and eased it back onto the road. That was lucky. After three or four hours a lunch break coincided with a race between me and an ominous storm ahead blowing my direction, forked lightning flashing across the dark horizon. Ten minutes after pulling up outside the Cavalo Preto, a handy travellers hotel and one of the few concrete buildings in the settlement of Chongoroi, I was sitting at a table in the covered terrace when the dark air swept in the storm, ferociously whipping the rain inside and drenching anyone caught outside. It was wild. As I scurried out to draw over the tankbag raincover, a tremendous crack of lightning exploded in the street. I automatically recoiled and a diner standing at the door I’d just passed through was knocked off his feet! As it was still teaming down after my meal, I decided to give up on the rest of the day as the road surface would be too messy for the bike. It was St Patrick’s Day and I decided a few afternoon beers could be justified. The following day it was more of the same, slow progress through the potholes. I didn’t mind it too much as it was just a matter of slowing right down, taking it easy - eventually the hours pass and you make progress. Two hours got me to Quilengues where in a search for a coffee and some form of breakfast, the best I could find was a bowl of noodle broth. And I was the entertainment for the five or six lads in their early twenties drunk at 10 on this Sunday morning, I assumed since the previous night. I find it tiresome at the best of times talking with drunks (unless of course I’m in a similar frame of mind! ), and young ones I have no time for. So addressing the most lucid while ignoring the other silly ones, I tried to explain Self Help, the charity hoping it would make some impression on him. He was a teacher. Apart from a bus - I pitied the poor passengers being thrown about inside - the only vehicles seemed to be the odd very shiny looking 4x4 coming the opposite direction. In the Cavalo Preto I’d lunched with a telecomms executive and a nightclub owner from Benguela both en route with their new vehicles. I learned that if you could deal with the rough ride, it was an attractive proposition to buy your new vehicle in neighboring Namibia. One of them had just bought a Toyota Hilux for US$30,000 including import duty, for which he would have paid US $40,000 in Benguela. The final 80 kms to Lubango was easier. I was tired and pulled over to rest under the shade of a small lean-to. My experience had shown me it is very difficult to find somewhere to snooze during the day, as there is always someone about, and they will come sometimes great distances to check out this arrival from outer space that has just dropped into their back yard. And before long I was aware of the approach of some children, though I remained where I was dozing. I could hear the whispers, keeping their distance a few feet from me - probably staring. After a bit of a rest I scattered them in terror by suddenly rising and growling. Then it was all smiles as they shyly accepted some nuts and biscuits I offered around. As I only had a few more days before crossing into what I anticipated would be a far less impoverished Namibia, I distributed what remained of my pencils and stickers. They were all divided up fairly, and it was gratifying to see their pleasure. Lubango I was told is one of the nicest provinces in which to live - owing to its elevated location and European feel. If I was expecting a European style city nice to walk around, I would have been disappointed however. Of course the war had taken its toll here as well. Mountains surrounded half the city offering an impressive backdrop, and the suburbs high above the city with its large walled off homes and security guards appeared very affluent. However I found very little charm in the rectangularly laid out city streets. In search of some postcards was an interesting experience - there weren’t any, as there is no market for them! I did eventually manage to track one down, the last one in Lubango, pinned to the wall in the Post Office. It was quite faded and displayed a picture of their national animal, an antelope indigenous to Angola - the Palanqua Negra. I did find Cafe Huila which, though expensive, had real espresso, frequented solely by Portuguese ex-pats and white Angolans, and was happy to be able to buy a selection of their highly regarded pastries as a gift for my hosts. My lodging was outside of town with the Padres Salatinos, in a very comfortable conference centre. I believe it was the most comfortable bed I slept on in Africa! Once again I was received with humbling hospitality and fed well. It happened to be right next to the brewery for the nicest beer I had drunk so far in Africa - N’Gola. I met and chatted with a few of the resident priests and deacons, discovering among other things UNITA operated north and east of here. Their principle funding had come from lucrative local diamond resources which they controlled, along with covert support from the CIA and the South African government. In discussing the civil war with mainly clergy through the country, it was difficult to ascertain with which particular side their sympathies lay - MPLA or UNITA. Apparently neither. Facial hair adornment I noticed among the Angolan clergy seemed a stylish sign of intellect - nearly every priest and aspiring priest I met in Angola seemed to cultivate a goatee of varying degrees of tidiness - some impressively suave, others wispier, more ‘wannabe’. I guessed it might also indicate any European blood as I don’t think the local African genes are particularly hirsute. Even though there were still thousands of miles to Cape Town, I understood crossing the border to Namibia meant leaving the bad roads, the colour, animation, the daily challenge... ‘Africa’ behind me. So it was with a sense of poignancy I set out from Lubango for the Namibian border, on the ‘the last lap’. Small experiences were magnified in my mind, I drank in the scenery, actually made an effort to stop and photograph a traditional Numialas woman, all with a slight sense of parting. Knowing it was the final few hundred kilometres of potholed roads I nearly even appreciated it. Well not really. It was back to the same slow progress. The landscape had begun to noticeably change in the past few days from hilly very green, full bush to a more savannah type growth - plains and grassland with scattered scrub. The thought struck me that coming through the continent from north to south, the vegetation mirrored itself. It was becoming more like sub Saharan Africa - maybe Burkina Faso. Before long healthy looking grasslands began to predominate. Where there were still some “…weed choked exits to the great abandoned farms” from recent years, neat fences stretching for miles now indicated some of the huge ‘fazendas’, or ranches, were back in business. In the past few days I had noticed periodically, three or four sacks stacked on the side of the road, with no one in attendance. Inspecting one I found it to be charcoal. Apparently there is a profession of ‘charcoal burners’ who wander the province, in old beat up trucks or even carts, in search of wood to make charcoal. The product is then sold on the side of the road by an understood code of honesty. No one carries off a bag without knowing who to pay. Lunch that day was roadside grilled... meat. From what animal I couldn’t ascertain. Sitting under a tree for a rare thirst quenching cold Pepsi in the village of Cahama, one lad waiting for a bus told me it took eight hours to get the two hundred odd kms to Lubango! I gave him a sticker which he accepted with delight. Lightly chatting and flirting a little in the lazy afternoon heat with a pretty mulatta also waiting for the bus, she called my bluff accepting readily my jokey offer of getting up on the bike behind me and taking off. I wondered what her hopes or plans were in the big smoke of Lubango. The approach to Xangongo was along a levee, a raised road across miles of water, reeds, and low lying fields immersed under the local Cunene river. This name is legendary in the battle between South African forces and the MPLA in the war. The Cunene river dam lies downriver near the Namibian border, and Xangongo was seen as strategic, seeing much action. The bridge I crossed into town was a solid metal one, while fifty yards away the remains of the original bridge projected out into the water, a crowd of colourful, shouting boys and girls diving and swimming off it. I was told later the original was blown up by the South Africans, and the metal one I’d crossed was the replacement built by the Cubans. 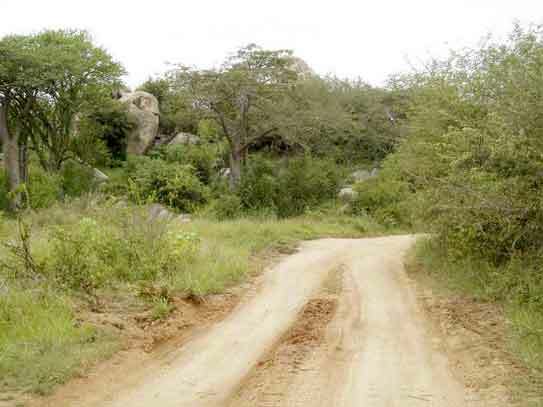 The final hundred kms to the Angolan town nearest the border was in the process of being rebuilt by the Chinese and was well graded, allowing a straightforward ride to Ondjiva. Off to the side I passed some wrecked and rusted tanks, relics from the war. 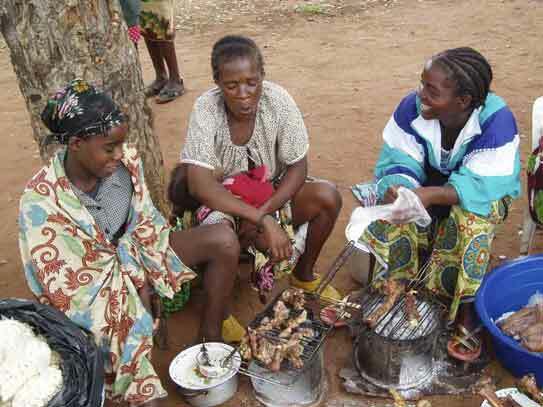 Finding the Missao Catolico ten miles out of town, once again I was made feel welcome and fed stewed beef and funge - the corn porridge - in the communal refectory. Father Luis, the parish priest, was young, well educated and full of energy. He spent ages asking me about my bike and... coveting it in fact. He had a 125 cc off road bike he used to get to outlying communities, sometimes up to fifty kilometres in distance on sandy and muddy tracks. So close to the border, it was inevitable I would hear of how the white South Africans were regarded here. 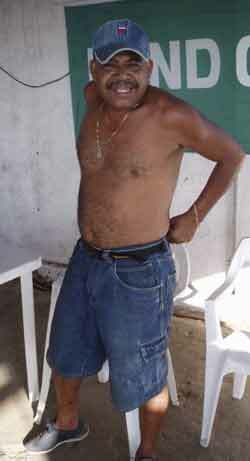 “Ombulus” as they’re known, are not the most popular of nationalities in this part of the world. I was told grizzly tales - of the walls of the Kafima Mission daubed with slogans in blood “We kill here SWAPO”, the blood apparently of priests and civilians killed in indiscriminate aerial bombing. There were many acknowledged atrocities by the South African forces. I was also told of Padre Leonard Shikufinde, a nun, and seven infirms being pulled from their van by soldiers twenty kms from Xangongo and murdered, despite being in clerical garb. It is still unknown whether it was UNITA or MPLA. There is a huge well of memories that will take generations to heal. The following morning I would travel the half hour further to the border and enter Namibia. Angola left me with many impressions, and it would take some time for them to settle. The most challenging of the countries I had travelled through, the obvious difficulties were the road conditions, and of course my inability in conversing in Portuguese. Also however it was the lack of an established infrastructure and local economies that is the usual result of communities evolving over the generations, that give it a disorganised nearly temporary feel. I was left with a feeling of sadness at the destruction until very recently of the country, and little apparent progress in rebuilding despite huge wealth in natural resources. I can only imagine the effect on the families of the thousands killed in the civil war. As one priest commented, it will take generations to heal.